John has performed in clubs, theatres, and weird little coffee houses across the country for almost three decades. Yes, there were some day jobs along the way.John grew up in Boulder, Colorado - which is a damn good place to be from if you're Hippieman. He made his comedic debut sometime around 1980 at the Blue Note in Boulder. John has toured extensively over the years and continues to do so. 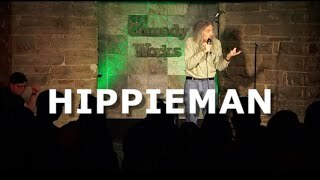 He made his network debut on The Late Late Show with Craig Ferguson, has written a screenplay - Hippieman: The Movie and is currnetly working on a comedy pilot.In the future, John will continue to perform and develop Hippiemans plan for America - comedic solutions to our nations problems. And be happy.